There is a calendar of all GANT activities as well as a list of participants with dates of stay. A new page collects references, slides, lecture notes and other documents related to the recently completed Winter School. The goal of this semester will be to investigate various important problems in number theory which have been successfully approached using the existence of some group action. - Automorphic periods, L-functions and allied analytical problems. - Prehomogeneous vector spaces and their relationships with number fields. The semester will bring together a mix of junior and senior researchers in these rather diverse fields, in order to help disseminate knowledge of the variety of techniques involved, and to discuss recent progress and communicate new results. We would like to put an emphasis on the exchange of ideas and on the identification of new approaches obtained by combining the existing techniques. Weekly seminars as well as mini-courses will be organized during the course of the semester. 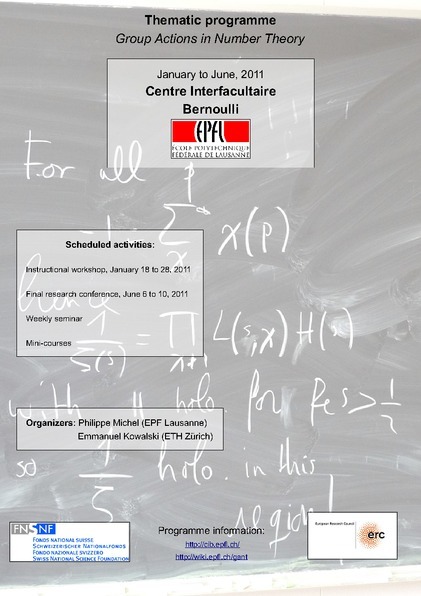 In addition, each year, the number theory groups of EPFL and ETHZ organize their Number Theory Days (NTD) alternatively in Lausanne and Zurich. The 2011 Number Theory Days will take place in the spring in Lausanne, and it is expected that part of this program will be closely related to the GANT semester. Some ressources are available for people interested in participating the program for medium to long periods. To be considered please fill the following Application form. Important Notice: depending on the applicant nationality, it may take up 3 to 4 months to obtain a valid swiss working permit; the applicant should therefore take this delay into account when giving his prefered period of visit. Each case being specific, it is advised to contact Christiane De Paola christiane.depaola@epfl.ch for more precise information.